Further, a trigon cannot be joined with a hendecagon, for this would leave fifty six thirty thirds of a right angle, which is not the angle of any regular figure. The triangle extension theorem shows that rhombs provide a solution to the issue raised by Kepler that is quoted above. 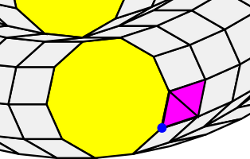 If rhombs are allowed, any vertex figure of three polygons that includes two regular polygons, one of which is a triangle, can be extended to a periodic tiling of the plane. a. The third polygon is a regular polygon. b. The third polygon is a rhomb and n is odd. If n is odd, we can replace the rhomb that has the angle nπ/3n = π/3 with two triangles. The blue dot then shows the vertex figure with the n-gon, triangle and rhomb with angle (2n+6)π/3n. Here we can use a simple trick. 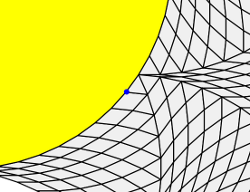 By the regular polygon extension theorem proved in the previous section this vertex figure can be extended to a periodic tiling of the plane. However the rhomb with angle nπ/3n =π/3 is the rhomb consisting of two triangles glued together. Replace this rhomb with two triangles and we have a new vertex figure consisting of a n-gon, a triangle and a rhomb which can also be extended to a periodic tiling of the plane. c. The third polygon is a rhomb and n is even. The blue dot proves the third case of the triangle extension theorem. Let's use the same trick as in case b. We have the n-gon and the rhombs with angles nπ/3n and (2n+6)π/3n. If the rhombs are not elements of SRI(n/2) then we can then replace the nπ/3n rhomb with two triangles as in case b. and we are done. But suppose these rhombs are members of SRI(n/2)? We cannot apply the regular polygon extension theorem, but we can use another observation to complete the proof. Let n = 2m. Then (2n+6)π/3n = (4m+6)π/3m = ((4/3)m+2)π/m. Clearly this is only a member of SRI(m) = SRI(n/2) if m is divisible by 3. This means that n must also be divisible by 3 and since it is even, it is in fact divisible by 6. Let n = 6r. Now we can use the fact that a regular polygon with 6r sides tiles the plane with a rhombic star. As you can see from the accompanying illustration, this tiling includes a vertex figure composed of a triangle, the 6r-gon and a rhomb! The rhombic star is constructed from the rhombs SRI(3r) = SRI(n/2) which is a small subset of the rhombs SRI(3n). So the theorem is true in all three cases and we are done. Is it possible to generalise the triangle extension theorem to include vertex figures that include any two regular polygons? Perhaps, but in order to do so we need some more machinery as we will see in the next section.